Terranea Resort is located on a 102-acre peninsula just minutes away from the hustle and bustle of Los Angeles city life. Guests who step into this private paradise will find themselves in a world surrounded by tranquil waves of the Pacific Ocean on all three sides, and Catalina Island just across the channel. Terranea incorporates its Mediterranean heritage into the resort’s coastal setting, through the architecture in the lobby, outdoor gardens, courtyards, and every private terrace. A popular destination for locals and travelers alike, this well-maintained southern Californian resort is constantly changing and improving over time. Terranea is a luxury eco resort that offers a wide range of suites and guest rooms, including a selection of Casitas, Villas, and Bungalows. The resort is also home to a famous and award-winning par-three golf course with nine holes, an oceanfront spa, eight distinct and recognized restaurants, bars, and cafes, and four ocean-view. Built to resemble paradise, it’s no wonder that Terranea has been a regular setting for many Hollywood films and TV shows. A coastal resort that stretches out to the Pacific, Terranea is also known as one of the top cruise port hotels in Los Angeles and the United States. Thus, people can reach the location via car, boat, or plane easily. Getting to Terranea Way from the North is but a matter of taking the Hawthorne Blvd onto the CA-107 exit and turning left to Palos Verdes and then right to Terranea Way. Those coming from the South can take CA-91 exit along Artesia Blvd, then left to Hawthorne Blvd, another left to Palos Verdes, and right to Terranea Way. Terranea’s wide variety of accommodations is categorized into Guestrooms and Suites, Bungalows, Casitas, and Villas. All these accommodations are expertly designed to combine natural beauty with the 102-acre coastal setting with each interior. The oceanfront guest rooms and suites are spacious, ranging from the 450 sq. ft. rooms to the 2,200 sq. ft. Presidential Suite that has amenities such as a flat screen TV, pillow top bed, and many more. Those taking the Guestrooms will have a resort view, ocean side, or ocean view. The rooms will have a king sized bed or two double beds that come with luxurious linens. The bathrooms have separate bathtubs and showers. There’s wireless Internet access, two dual line telephones, an iPod docking station, and a 37” LCD flat screen TV. Rooms also have a private balcony or patio. The Luxury Suites are 900 sq. ft. and come equipped with all the amenities of the guestrooms and more, such as five-fixture stone master bathrooms, two LCD flat screens (60” and 42”), an in-room bar, Bluetooth speakers, and built-in charging stations. The suites can also be expanded into two-bedroom suites. 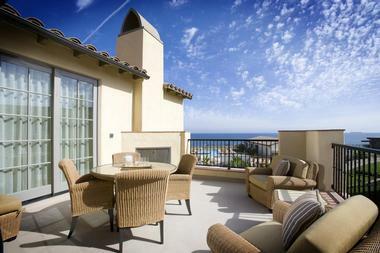 Terranea also has three premier suites by the ocean, namely the 2,200 sq. ft. Vanderlip Suite and two 1,800 sq. ft. Shearwater Suites, which were intended for families or guests that travel with their personal staff. 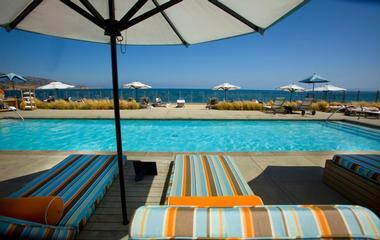 The Bungalows are set just beside the ocean and close to the Terranea Spa and café. They’re designed for adults looking for a private getaway and some VIP treatment and more luxurious amenities. The Bungalow suites are 1,100 sq. ft. and feature a pillow-top master bedroom with king bed, a five-fixture bath with separate tub and shower, a living room, kitchen, guest bathroom, indoor and outdoor fireplaces, and more. They also offer 10% off on all spa treatments, salon services, and spa cabana rentals. A personal concierge is available 24-hours to address requests from the guests. For those going on a vacation with the family, the Casitas make the perfect option, thanks to their expansive views and luxurious suite amenities. 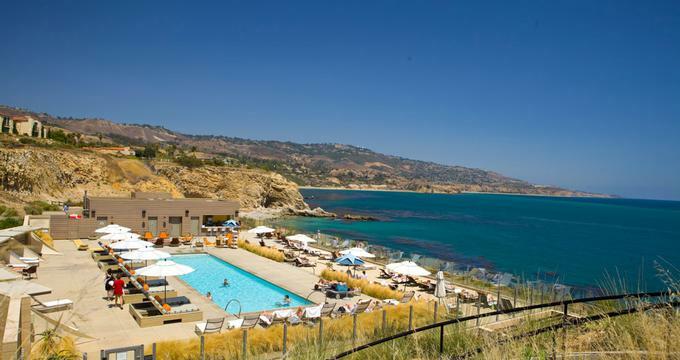 They’re situated along the resort’s east and west sides close to the Palos Verdes Peninsula. They have private entrances and give off a residential feel with the kitchen, living room, and even laundry facilities. Casita suites can have one to three bedrooms and all the amenities of a suite accommodation. For even more privacy, the Villas are situated in the secluded enclave of Terranea. They are available in two to three bedroom designs and feature a living room, a private garage, a full kitchen, and even some outdoor fireplaces (for select units). The Villas overlook the Terranea Golf Course through the large outdoor terraces. Whether it’s a romantic dinner or a business meeting, Terranea has the right dining destination for all occasions. Overlooking the Catalina Island and Pacific Ocean views, each of the resort’s eight award-winning restaurants offers both satisfying tastes and sights. Every location has its menus tailor fit by the resort’s chefs who use only the best locally available ingredients for each dish. The meals can also be ordered for complete in-room dining 24 hours a day. Mar’sel is the ideal location for elegant dinners or late night meals. The place has a stunning view of the Pacific Ocean while guests enjoy their meals composed of seasonally rotating sets of fine dining dishes made out of locally sourced ingredients. The experience gives an inventive twist to California cuisine. Catalina Kitchen is overseen by Chef David Tarrin, who adds Spanish, Greek, French, and southern Italian flavors to the California and Mediterranean cuisine. Individuals, families, and friends can enjoy the must-have breakfasts, market-style lunches, and elegant dinners in a spacious environment. The place is also known for its specialty pizzas, Friday Night seafood buffets, and Sunday brunches. Nelson’s has been recognized as among the top ten eco-friendly bars in the United States. It’s a great place for enjoying fresh California cuisine while basking in a beautiful sunset view by the patio or watching a sports game indoors. The Terranea Lobby Bar is the place for cocktails, spirits, and wine as well as some microbrews and international beer. They go great with the bar bites offered in the evening. There are also regular musical performances for guests’ entertainment. Bashi Restaurant offers a more culturally diverse set of dishes within Terranea. Enjoy many of Chef Bruce Nguyen’s selection of Asian contemporary flavors that go great with different artisan mixes, sakes, and a wide selection of Asian beer. The Terranea Spa Café is a great place for salads, sandwiches, fresh juices, smoothies, and other treats that are great after a relaxing day at the spa. Guests can order their food by the pool, fire pit, or in the cabana. Sea Beans is Terranea’s coffee bar. Guests can start their day with a freshly brewed cup of coffee along with a nice selection of breakfasts and lunches. Since it’s located conveniently next to the fashion boutique and activity area, the café is a great place to stop for some espressos, smoothies, pastries, and other tasty treats at any time of the day. Cielo Point offers a unique dining experience within Palos Verdes, serving guests with its poolside, full-service bar. It’s the place to be for guests who want to dine by the Cielo Point beach. Embrace the natural beauty of a California setting while overlooking the Pacific Ocean as well as the Palos Verdes coastline at the resort spa. With 50,000 sq. ft. of indoor and outdoor space dedicated to health and wellness, guests have access to one of its 25 treatment rooms, a full service salon, fitness and wellness center, and the Spa café. Aside from the luxurious VIP suites, there are both indoor and outdoor lounges that have steam rooms, saunas, whirl pools, fire pits, and cold plunges. Guests can also take part in yoga classes, workout at the gym, indulge in locally inspired massages, and get pampered with skin care treatments. A wide variety of limited and regular packages for a better spa experience is available. With 102 acres of oceanfront beauty, Terranea’s premises make a great backdrop for so many grand events, including weddings, conferences, family reunions, and more. Not only is the environment inspiring, the venues are also set to encourage as much relaxation and interaction as the event calls for. With the help of Terranea’s event planners, guests are sure to be able to make use of the resort’s varied facilities to meet the specific needs of the event they are hosting. A team of experienced conference service professionals is available to help them pick the right accommodations, resort activities, and even food for the event. Either way, guests of the event will feel like they’ve been transported to a different destination for the duration of their stay. Rooms start at USD $450 per night. Browse more great Weekend Getaways from Los Angeles.